Amazon has long since given up on maintaining an exclusive grip on the titles they publish, but that doesn't mean they can't find a way to turn it to their advantage. They've just announced an early sales program called Kindle First, which will give Kindle customers the chance to buy AmPub titles a month before they are officially released. 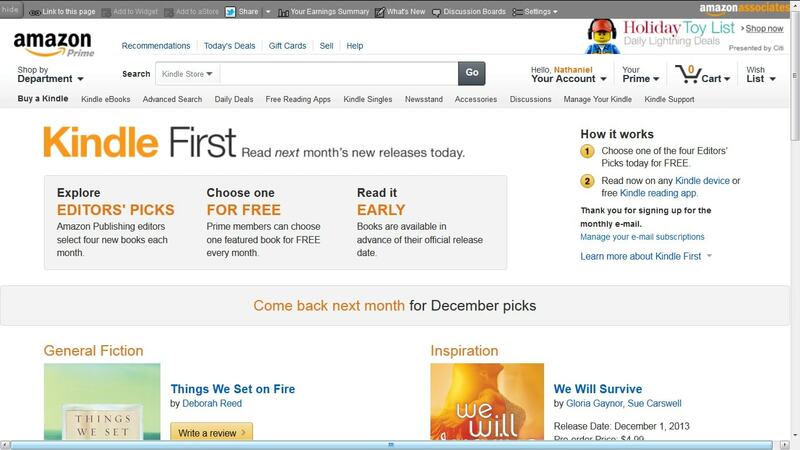 While Amazon usually sells their ebooks for $4.99 each, the titles offered via the Kindle First promotion will cost $1.99 (free for Amazon Prime members). Customers can choose one of the featured books each month at the discounted rate. The program kicks off today with 4 titles, including Things We Set on Fire, by Deborah Reed; No Place for a Dame, by Connie Brockway; Silent Echo, by J.R. Rain; and We Will Survive: True Stories of Encouragement, Inspiration, and the Power of Song, by Grammy-award winning recording artist Gloria Gaynor. These titles were scheduled to be available in the Kindle Store and other ebookstores on the first of December, but thanks to Amazon's new program they are on sale today. Amazon's publishing efforts have been getting a lot of attention over the past week following the news last Friday that Larry Kirshbaum was leaving his position as the head of Amazon Publishing. This lead many to write wild stories about Amazon retreating from NYC. Amazon confirmed the story but denied the crazy interpretations some placed on it, and in the week that followed Amazon has launched a new literary magazine, a new publishing imprint called Lake Union (they're publishing Deborah Reed's novel), and launched a new sales tool called Kindle Countdown. The free ebook-a-month for Prime subscribers is a loyalty incentive, the early access and reduced price to all comers is a promotional play. Note that, unlike the Prime library, this is open to anybody with a Kindle or Kindle app. Except for the fact that their ebooks still aren’t appearing anywhere except Amazon. Cute press release means nothing. Black is white. Peace is war. B&N sells Amazon ebooks. Where’s James Franco? Where’s Tim Ferris? The big names that Amazon actually plunked money down for are still solidly Amazon exclusives.